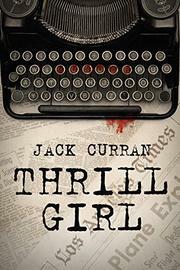 Thrill Girl has all the ingredients of a great genre read. Set in 1950’s LA, you got the war-hero-turned-beat-reporter, a leggy blonde, gruesome murders, ex-Nazis, and smoking. A lot of smoking. So much that the pages are saturated with tobacco. Stirred, definitely not shaken, within, author Jack Curran mixes an exciting tale of murder, vigilantism, the quest for truth, and, why not, even a monster. The plot is original, the characters are entertaining, but man, Curran doesn’t quite pour out the voice for the hard-boiled tale Thrill Girl has every right to be. Curran, working with a pseudonym, places himself in the story as a reporter looking into the vigilante known as Thrill Girl. He wants to get the As for all the Qs, or at least all the journalistic Ws surrounding this woman. Is she a hero? Or a threat? A typical femme fatale, or a beauty who’s a beast? Curran, the reporter, works through the story as Curran, the author, cleverly reveals pieces of the mystery at the right times. The wrong times are what drags the tale down. The dialogue can be plain jane dull as are frequent scene set ups. Curran might have the right recipe, but needs to work on the flavor. Missing is the quick rat-a-tat pulse of a Chandler or the immoral vulgarity of Elroy. Thrill Girl could be Glenfiddich instead of Old Grandad. What Curran might lack in style, he rips right ahead with plot, and in all honesty, makes the read entertainingly fun. The mystery is tight and remains good to the last drop. And Curran the reporter, is actually a good egg, one you don’t want to see crack on a desolate alleyway in old-time Hollywood. Many thanks to NetGalley for the advance edition and the hard-boiled fun. Great review. You hit all the plot points with humor, articulate comments, and gave your readers a fun read! Thanks. Phenomenal, yet subtle, with enough intrigue to spark a reader's hungry mind. The quality of words used to shape my ideas on this book. I'm left wanting more. Your use of vague details to paint a broader picture is genius, and a genuine craft.